Over the summer I decided that I would do something I always wanted to do, but never had the courage to commit to. I wanted to run a 5K. It started as a this-is-what-I-want-to-do-and-hope-I find-the-time-to-do-it to a this-is-going-to-happen-no-matter-what. The change happened gradually. At first I trained when I could, but then I had to put the money where my mouth was and actually set a date to run a race (thanks to the gentle but firm prompting from my friend and racing cheerleader Denise Wyatt). And so I did… August 8th. That’s when it got real. And I started training with more intensity. The relaxed attitude I started out with disappeared. I found myself pushing my limits, and exercising much more regularly. After all, I didn’t want to be the last person to cross the finish line. Maybe second to last, but I definitely didn’t want to be last. But try as I might, I never managed to finish a practice 5K walk/run in less than 52 minutes. I blame the fact I never ran much before and I didn’t have long to train (only a few months). But regardless of my time, I was going to run dammit. The day arrived and I was pumped! So many people and all of us there to do the same thing… run a race! It was exhilarating and I loved basking in the feeling. My husband and son came to cheer me on from the sidelines, and when the announcer called, I followed my friend (Denise) and five hundred plus people to the starting line. In we squished like sardines or a sandwich getting squeezed into a bag much too small, we all pressed together tightly eager to pass the line and start the race. Minutes seems like hours as my friend and I chatted eager just to get going and be away from the crushing crowd. But I also reveled in it, the closeness, the camaraderie of like-minded individuals. And knowing that once the race started the camaraderie would stop and it would be everyone for themselves. The announcer spoke, but I couldn’t hear a word of it. The wall of people around me made it impossible to hear anything but the conversation of those closest. But I didn’t fret. I knew it would be time to go when those in front of me started running. And they did. One minute a crowd of backs, arms, and legs barred my view and the next people were moving around me. I started running, not really because the race began, but because I was afraid those behind might run over me. I started out too fast, but quickly adopted a steady pace as I frantically search for my husband and son on the sidelines, but it was no use I was stuck in the middle of a running mob, so I returned my focus to in front of me so I don’t trip and fall. I don’t think I even ran a full quarter mile before I had to stop running. My heart felt close to bursting and I was disappointed to stop so soon, but I started a fast walk and realized that many around me were walking already too. And so it went, the rest of the race I walked for awhile and ran for a real little while. The scenery was peaceful. About as peaceful as it gets as most of the race ran right through a local cemetery. And it was nice not getting run over by cars, so there was that benefit too. I finally got close to the end. I managed to keep a steady pace, so I’m not all tired out. 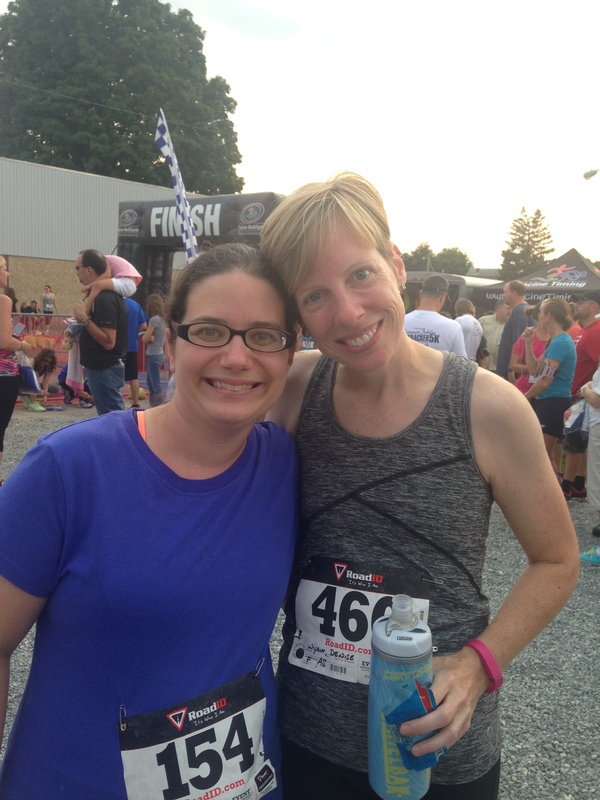 My friend Denise came back to catch up with me and encouraged me to run the last little bit. I couldn’t help but smile. I knew she crossed the finish line at least ten minutes ago, probably more. Good for her. So I ran again. I rounded the corner and the sidelines were full of people cheering me and the other racers around me on. I saw the finish line and ran for it. The excitement was so much I could hardly contain it and knew I was smiling like a fool. I got closer to the finish line and I saw a huge digital clock next to it. I did a double take and couldn’t believe my eyes. 46:02. Was the clock broken? It must be. Yep, it was and it was all I could think about as I finally crossed the line. Someone handed me a bottle of water as I walked away from the finish. I took it gratefully and felt a great satisfaction for finishing my very first race, but all I could really think about was… Did I really run that race in 46 minutes? Seriously? Me? No freaking way. How the hell did that happen? It took me a good ten minutes to find my husband and son. The place was packed and it didn’t even occur to me to set a meeting spot for after the race. Hell, until that moment I didn’t even think I was going to finish the race. But damn if I did, and it felt freaking AMAZING!!!! Afterward it took me a long time to settle down and get some rest, but as I drove home with my family I couldn’t help but compare my experience with the 5K to my writing. It felt a lot like deja vu. Writing started as a maybe-I’ll-do-it to a I-am-doing-this-for-sure. The more I wrote the more serious I got about writing. Though no matter how much I wrote it never seemed enough and I always finished with less than a desired amount and quality. And god don’t get me started on how many times I failed my expectations. That’s such a very sad and terrible story. So let’s skip to the good part, the I-finished-a-freaking-5K part. The part where I finished and I did more than expected. Just wow! I mean really, wow. I never saw it coming. 46 minutes!!!!! And I realized I did it because I practiced as much as I did before hand, I let those around me influence me and it helped me run faster, and I stopped trying to push myself so hard and I raced at my pace, not everyone elses. An epiphany for the ages. One I won’t soon forget. So next time I get to feeling overwhelmed or frustrated about things not going the way I had planned or hoped (in my writing or anything else I might be doing). I will remember that practice makes the outcome better, surrounding myself with like-minded individuals makes the journey easier, and that no one but me can determine how fast I go and when I reach my goal. But even above all of that, the most important part is… I did it. I finished the race. I wrote that book. I did whatever it is I set out to do. Or heck, I could just think… 46 minutes!! !… and it would be enough to put a big goofy smile on my face. “The announcer spoke, but I couldn’t hear a word of it.” – LOL – it is always like that! Many times I’m not even sure when the race starts. ” I started running, not really because the race began, but because I was afraid those behind might run over me.” – LOL! “46:02” – that is a great time!!! I’m usually very slow – one of the last people to finish – sometimes the last one. That drives Harold nuts as he’s so much faster than me.